We all know the fact that we need both web designers and web developers to build a fully functional site, especially for business purposes. 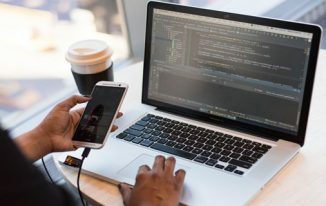 Designers have to design impressive layouts and other graphics for their websites, while the developer will convert that design into HTML or other suitable language. Notwithstanding this global principle, the story would get an amazing twist when we invite Webydo to the stage. It is leading the current website design revolution with their professional online website design cloud software. 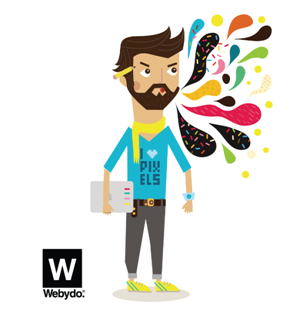 Already more than 70K professional web and graphic designers have adopted Webydo as their primary platform for website creation and are rapidly growing their design agencies and client base using Webydo. In light of our experience, it was obvious for us to call Webydo an incredible website design studio, and that is why we decided to review Webydo. We will share with you more about not only Webydo but also how it will help you in a way so that you can satisfy your clients’ requirements without hiring web developer to write code and enjoy the freedom of creativity with this professional code-free platform. Webydo is a B2B online design platform enabling web and graphic designers to create website code-free and with pixel perfect accuracy. Offering a comprehensive design management system (DMS), designers will feel right at home with the familiar Photoshop like features and be able to begin creating right away. Other than giving you raw website files or code, Webydo offers integrated website hosting. In light of these features, we do say that Webydo is a complete web suit for web designers as well as internet marketers, as it will help you set up and publish the site by entering no code at all. In technical terms, we can call Webydo a DMS – Design Management System – as well, which offers an in-built, customized CMS that your client can use to edit the website. And all websites will have cross-browser and responsive capabilities. Fist, just as any other online site builder, you have to create a free account in Webydo. If you have provided email ID and password in registration section, you will soon be led to the first option of creating a website – selecting method to build your site. You can choose to start from one of the readymade design inspirations, a basic layout or from a blank canvas. In the first option, you can choose from the preset site designs, in which the complete design, including layout, texts, images etc, will be available. In the second however, you can choose the layout, and will be able to insert the elements you wish. In the third counterpart, however, you have to start from scratch, which includes inserting divisions, other kinds of layout elements, images, text etc. In first two options, you can see a page for selecting the design whereas in the third, you will directly be led to Webydo design studio. 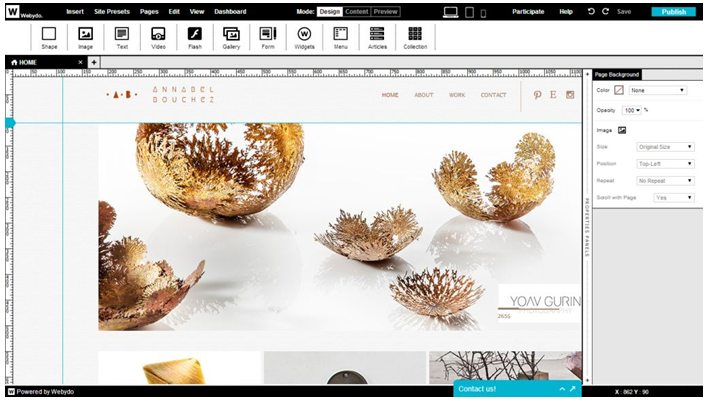 After you choose where to start, you can see that fully-fledged design studio of Webydo. This WYSIWYG-based web suit may resemble Adobe Photoshop or Dreamweaver in some perspectives, but what really matters is the productivity. 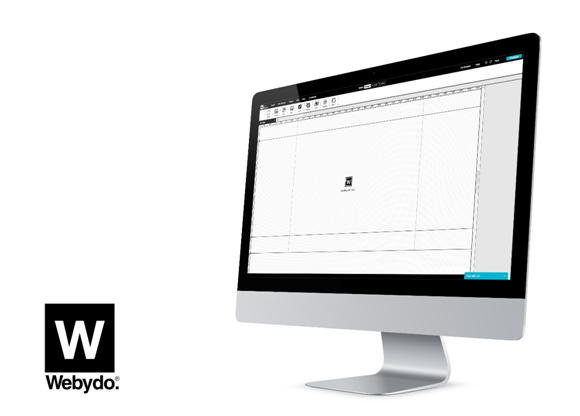 Now, if you have understood the basics of Webydo, you can start the REAL Designing! Apart from the superb User Interface of Webydo, which lets you insert, remove or edit elements of the site, It offers a number of features. 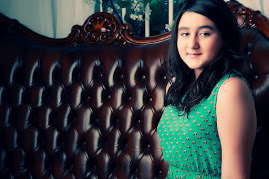 Some of those impressive features, we found in the service are as follows. Insert Widgets, just as you insert elements such as shapes, images, text, flash etc, you can insert particular widgets to page! For that, you have to click on ‘Widgets’ from Insert menu, whereupon, you can see the list of available widgets. Along with the HTML and iframe widget, there is a special widget called Ecwid Store, which will let you create an eCommerce store within the website. 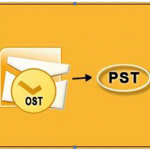 It offers multiple sections to different tasks. For instance, there are three parts – Design, Content and Preview that let you edit the layout, edit text content and preview the website respectively. This will help you mess up less. Formatting Websites and changing basic things about the website such as background colour, text colour etc is possible through section called ‘Site Preset’. Also, there is a page manager, using which you can manage different pages of complete website. Using it, you accomplish tasks such as page duplication as well. Once you have made all kinds of changes to the website, you can publish it by clicking on ‘Publish’ that is available at top right section of studio. Soon, you can see a message as shown in following image, and clicking OK will lead you to the actual website, which is hosted under a subdomain. Now, you’ve published the website and you should return to Dashboard to make any necessary changes or updates and continue working. So, you have created your free website using Webydo and hosted it under a subdomain. What is next? Yes, you have to connect the website to a custom domain. For this however, you have to purchase paid version of Webydo, upon which you’ll be able to avail several features such as unlimited pages, unlimited bandwidth, unlimited disk space, support etc. Apart from this, there is a section called ‘Settings’ for each website you publish. In settings page, you can do number of actions such as setting Google analytics code and Google Apps code, adding CMS users (if your client wants to edit the website) etc. Well, each website from Webydo is accompanied by a superb Content Management System, which will allow your client to edit website. In addition to these, there is an option to share the design with your friend or someone else so that he/she will give you suggestions or edit the site. 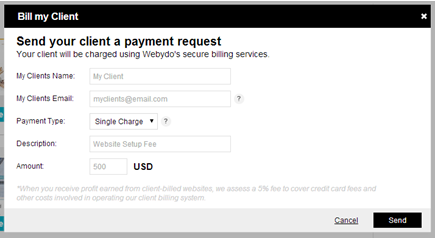 Yet another feature that we loved is the option to send payment requests using the Bill Your Client feature. It is sort of an official message to the client of yours requesting payment for that project. In that, you can mention client name, payment type, amount etc. and you will not have to work with a third party platform. After all, we would like to recommend Webydo for any professional designer who is going to create a website for their client or looking for a powerful platform to manage hundreds of projects from one place. 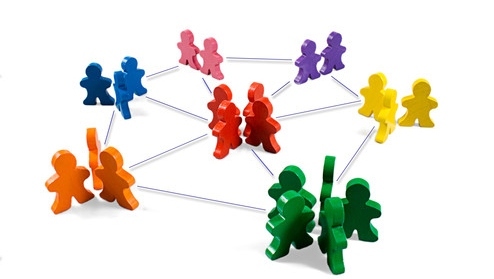 It’s support team is always available to provide assistance and the community of designers are actively participating in the forum as well to contribute to the future of Webydo. Create your Free account and join the design revolution. This article is proudly presented by Webydo’s community of professional designers. Sounds like a great website builder, i have used a few website builders in my time but find they are limiting in some way or another, i wonder if Webydo can live up to the hype. 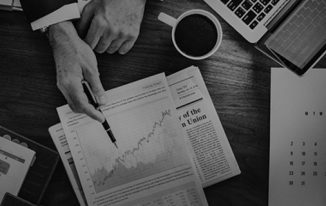 The particular platform’s technique technology sauce is their clever algorithm that turns any style built using the software into industry-standard, W3C-validated, cross-platform HTML5. Without the need for the developer, designers can function more closely making use of their clients, and Webydo’s easy-to-use built-in CMS allows designers the freedom to help upload along with edit content material themselves without under-going you for each update. Look like a powerful website builder, i have tried some but this really impress me. Webydo, looks very interesting. It worth giving it a try.